I have been using Lumia 535 for 1 Month the problems that I face was touch problem.low battery back up.and over heating ..touch problem was resolved by updating and putting an screen guard on it .but two problems still remain.i think Microsoft will give an update on it..otherwise its an awesome phone.so far so good..
And always remember how much you cost for it. i like the design very much compared to other competition in this range nokia pays special attention and also its have a range of customizable back panels that being said the back panel is finger print magnet as well as the touchscreen there is no camera button so you should click only through touchscreen.we cant hot swap the sims unless like sd card. and the power microusb connector on the bottom of the phone and the head-output on top and the volume rocker and lock/power button and right hand side.The grip of the phone is slippery. The phone comes with denim update and there is no touch screen problem for mine i ordered on 1/1/15 and i dont know the touch issue was because of the software or hardware.The screen looks good but reading in sun light is bad unlike you increase the brightness by manual. when using camera and other task intensive process the phone becomes heaty around the camera but is bearable "not so hot". storage sense,wifi sense are nice addition u can manage space easily and wifi operation neatly. i got 12-15 hours on a single charge with some songs and videos and games and a couple of calls and messages. a nice solid low-end phone which is going to become outdated in terms of processors and features as we are in 2015. All is well excellent phone only problem is HD video problem. How to install app loker for Lumia 535.actually I installed one but it is not working. Its worst Lumia phone. It cannot play hd video. And the primary camera is not god. The touch is very bad.hope Microsoft will resolve the problem very soon. kishore, 14 Dec 2014Very bad experience for me using Lumia 535, touch screen is too bad &#128078; although It ... moreDon't worry the update has been released now. 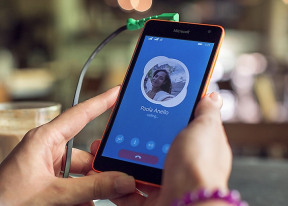 Connect your MS Lumia 535 to a Wi-Fi network and get your phone updated. Problem solved. Can anyone tell me that does Microsoft Lumia 535 supports OTG or pen drive connecting option.? Can someone please tell how is the spreadsheet functionality in the Office App? There were shortcomings in the previous editions. Thanks. how can sony experia m2 with lower 2300 mAh battery have almost double video playback and browsing time eh? First impression mobile in comfortable budget. Mandy, 19 Dec 2014Why cortana is not working in indiacortana is still in beta, few language support. if you want to use cortana, you have to change region setting to either of the country that support cortana.